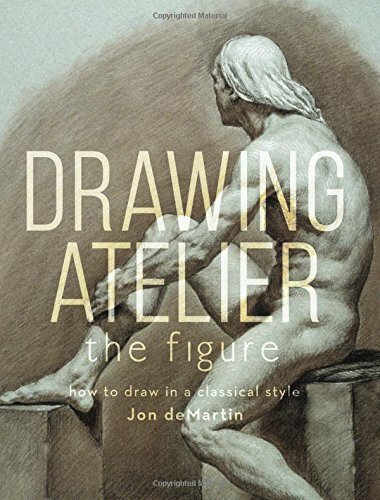 Drawing Atelier by Jon deMartin is a book filled with useful tips on drawing the figure in classical style. The content is written for beginners who already know basic figure drawing. It talks about specific techniques that you can use to improve your drawings, accuracy, shading, understanding of form. The book starts with basics such as the tools to use, how you should think about drawing (from copying Old Masters work) and understanding the importance of anatomy. The latter lessons are look into the human figure as a whole, and then into detail such as focusing on the head and features, hands and feet. The last lesson elaborates on poses and how you can draw more dynamic figures. The book's focus is to help you understand the why instead of just copying blindly what you see. Jon deMartin wants you to understand the anatomy that causes the form and also points out important things to note when drawing different parts of the figure. The instructions are clear and easy to follow, and the illustrated examples are beautiful. The book will benefit those who draw at life figure drawing sessions, but the tips, especially the sighting techniques, can be applied to drawing outdoors too. Highly recommended to all who want to improve at their classic figure drawing. It's an insightful book. If you like this book, I'll also recommend you check out Anatomy Lessons From The Great Masters. And to learn more about classical drawing, see Lessons in Classical Drawing: Essential Techniques from Inside the Atelier.